We’ll start drearily this morning with a cold rain courtesy of low pressure moving by to our south (tis the season!). Northeast winds associated with this system will continue to bring in cool air from the north, and widespread cloud cover will keep most areas fairly chilly. Radar imagery shows showers mostly focused in the southern part of the area, closer to the low pressure system. Clouds and showers from this low will drift off to the south and east as the upper level disturbance behind the low moves offshore. This will result in skies clearing from north to south during the afternoon/evening hours. As a result, temps will be warmest in the north/northeast where the sun comes out first. Areas that won’t see clearing until after dark, SW NH for example, will likely struggle to reach the 50 degree mark this afternoon. Links are to additional information provided by weather.us. If you’re looking for a beautiful fall day, with cool temperatures, low humidity, and a nice northerly breeze, today checks all those boxes. A cold front moved through this time yesterday, and we’ve been left with picture perfect weather in its wake. High temps today will range from 55 in the north to 65 in the south, with a breezy NW wind. Skies will be sunny and dry today as high pressure builds in. It is with great joy that I can report the impending liberation of the Western Maine and New Hampshire area. Freedom is arriving from the northwest tonight, and will be in our area by morning as a cold front delivers us from the tyranny of 70 degree dew points and 90+ degree high temperatures! The Swiss HD model shows the front slicing through Portland at 6 tomorrow morning. NW winds behind the front will gust over 20 mph as cool, dry, freedom filled air pours in. High temperatures will return to seasonably wonderful levels, ranging from the low 60’s in the north to the mid 70’s along the coast. More importantly, dew points will plummet into the upper 30’s/lower 40’s as the humid air of the past several weeks is scoured out. Freedom, in the form of a cold front, is on its way, but first we have to survive another hot and humid day today. Highs will soar into the upper 80’s/low 90’s across NH and western Maine. 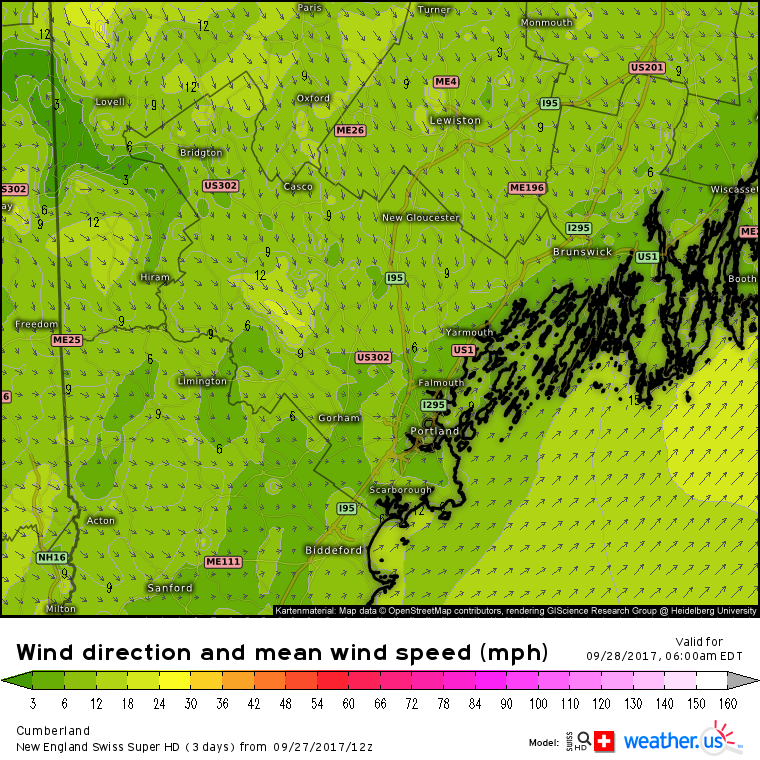 The midcoast will be cooler due to southerly winds developing off the ocean. Temps in the 70’s are expected there. Morning fog will burn off to afternoon sunshine with showers and storms developing this evening up in the mountains. The best forcing for thunderstorms will be in Canada, but areas north of route two will be close enough to get in on the action. Gusty winds are possible in some of the stronger cells. Shower and storm activity will wind down after sunset. Yesterday’s weather was awful through and through. Today’s weather will be slightly less atrocious, though still far from what we’d expect for September 26th. High temps will range from near 90 inland to around 80 at the coast, where a sea breeze will bring some semblance of order to the situation. Fog is dense this morning, but it will burn off by the afternoon hours leaving clear skies. As with yesterday, the area will remain dry except for some pop up showers in the mountains. Today will feature more of the no-good, very-bad heat that we had yesterday. Temps will rise firmly into the “no thanks” territory, especially away from the coast, where a sea breeze will moderate conditions a bit this afternoon. Temps inland will once again rise to near 90 while at the coast, readings in the lower 80’s are expected. There’s a chance that an isolated shower or thunderstorm will pop up in the mountains today, but we continue to sit under a large ridge of high pressure and as a result, storm coverage will be widely scattered and storm intensity will be weak. Links are to additional information, courtesy of weather.us. If you want to leave a comment expressing warm feelings for this heat, feel free to join the NYA XC team for interval training this afternoon before doing so. You will see your love of heat ripped right out of you, along with your lunch. Our savior the cold front arrives in 72 hours! The atmosphere appears to be a bit confused today as fall-like temperatures from the past couple of weeks give way to summer heat. Temperatures will rise into the upper 80’s or low 90’s for most today with slightly cooler temps in the low 80’s both in the far north and along the immediate coastline where a sea breeze will develop this afternoon. Sunny skies will be part of the fuel for the heat as little to no cloud cover is expected. There’s a slight chance of a late afternoon shower or thunderstorm in the far north where a very weak boundary will be located. Otherwise, dry conditions are expected across the area.